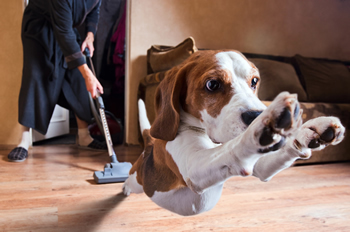 Insights to Dog Behavior | Simplest Fix EVER for a Dog's Fear of the Vacuum Cleaner! I really don’t know why so many dogs are afraid of the vacuum cleaner but they are. Both our Nissa and Gracie fall into this category so it’s something I wanted to find a solution for. Riley on the other hand scoots in and either stands or sits himself down between me and the furniture wanting me to vacuum him before I vacuum the furniture because he likes being vacuumed and he’s very persistent! Go figure, heh? Some dogs aren’t necessarily afraid but simply just don’t like the vacuum so they walk away and stay away from it while others are soooo scared they do some pretty crazy and sometimes dangerous things to get away from the big bad V-monster. Vacuums are noisy and some emit a really high pitched squeal so maybe it hurts their ears? Some dogs maybe think the person pushing the vacuum is going to chase them with it or maybe they’ve been previously chased some cruel idiot human who gets their kicks out of scaring the dog (please don’t do that!). Could be any number of reasons and I’m not concerned with all the why’s it could be because why doesn’t matter for the purpose here. I don’t consider our own dog’s fear of the vacuum to be a huge problem at our house, but I do know that in some houses this is a really big deal and maybe our solution will help them. I’m not fond of my dogs being afraid of just about anything because I know all to well the fear of something that more people than not consider to be a ridiculous thing to be afraid of. I want my dogs to feel safe and comfortable in their own homes and if they’re afraid of the vacuum they’re not feeling comfortable or secure when I’m motoring around sucking up all their dog hair! And no, dogs do not understand that us humans are cleaning up after them so gratitude from them is never going to happen. This is gonna be a really short post because the fix is was soooo simple there’s no need to write a novel about it. 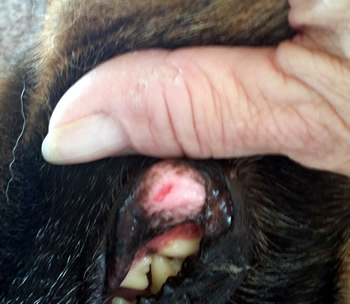 But for those who are looking for an answer to help their dog overcome this fear, I thought I’d share what we did at our house in the hopes it will help a few dogs and families out. It’s not often you’ll hear me say to ignore a dog’s fears, unwanted or negative behaviors but in this case ignoring was the trick to solving the problem. If only all behavior issues could be handled so easily! This has been a good, acceptable solution for both Nissa and Gracie. Used to be when I ran the vacuum, both dogs ran for their lives as fast and as far away from the noisy V-monster as they could get. Nissa would run to, hide and cower in her crate, Gracie would run, hang her head and stare at it from the farthest side of the room she could find and on into an adjacent room if there was one with visibility (she wanted to watch but not be close to the vacuuming activity) always ready to run to another room if I got too close and for her the length of a football field was too close! I found that by just going about my vacuuming business eventually they learned that I wasn’t going to chase them with it nor was I going to hurt them with it. If I got a little too close and could see they were looking for a space to bolt to, I’d stop and wait until they found their exit. It took Nissa much longer than it’s taken Gracie to be more comfortable when Mom vacuums. Nissa now usually jumps up on the couch or loveseat and watches even while I run the vacuum right in front of her. Gracie allows the vacuum to get within inches of her now before she calmly moves out of the way. She allows me to get close and then simply backs up or if she wants to go past the vacuum, I stop and tell her it’s ok and she’s happy to walk right past the screeching noisy V-monster. I like simple fixes like this one. 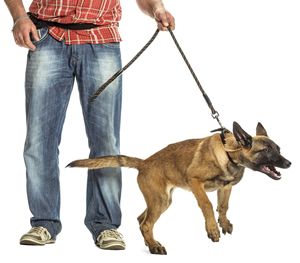 I get so many questions about difficult dog behaviors (some are downright dangerous) that people are struggling with that it’s nice to share a solution that didn’t require me to think so hard that it hurts my brain as it does with the more serious issues. I hope this helps some of those who are having vacuum cleaner vs. the dog issues. Unfortunately after 2 years of ignoring our German Shepherd’s fear of the vacuum cleaner, the problem is now worse than ever. I have her on the deck outside our class doors while I vacuum and she goes totally crazy and is now starting to put scratches in the glass. I have tried everything from letting her inside to inspect the vacuum while it’s off and while it’s on. I can’t leave her inside as she would attack the vacuum. Every time I vacuum now, I have to go outside and lock her away somewhere before I can clean the house (she is the same with the duster that makes no noise). It is quite obviously a feeling of being threatened for her. Any other suggestions? Seems to me being able to see the vacuum is scaring (threatening) her and the damage to your windows is an additional concern. The scratches wouldn’t bother me so much but her potentially coming through the glass and severely injuring herself (yes it can happen) would be the biggest concern for me. You might try showing her that the vacuum brings good things by treating her just before you vacuum. If you have a crate away from the vacuuming area and aren’t afraid she’ll hurt herself in the crate, I would try putting her in it (hopefully she considers the crate her safe place) give her some treats or her favorite toy for example and then close the door to the room the crate is in so she can’t see and the sound of the vacuum will be muffled a bit. If you don’t have a crate use a room farthest away from the vacuum noise. I wouldn’t expect this to be a quick fix, I think it’s going to take time but it’s something I would try anyway. Good luck! This is exactly what I do with Suki. I will vacuum where she isn’t, so that when she moves away from the vacuum cleaner, it will hopefully be to a spot I’ve already vacuumed, so that she doesn’t have to move multiple times. If she wants to go outside, I’ll open the door. If she jumps up on her chair, I will vacuum around the chair like it is no big deal. I just don’t make an issue over it. Thanks for sharing your story and methods. Gracie is getting even better with the vacuum as time marches on. Nissa still prefers to just move away from it and that’s fine. She walks away now rather than running so overall vacuum life is good here!